We sadly report the passing of David Dallimore, an English gentleman who emigrated to Australia and is fondly remembered by radio listeners for his twenty years of broadcasting and entertaining at the microphone of 6IX in Perth and regional stations 6WB, 6MD and 6BY. David worked in the manufacturing and maintenance aspects of the British aeronautical industry, before his wife’s parent sponsored him out to Australia, not long after the second world war. It was a time when the limited aircraft work opportunities were going to Australian returned servicemen, so David worked as an inspector for Chamberlain Tractors until a friend suggested he audition for radio. David had a wonderful voice for radio and was soon engaged by 6IX when located at Lyric House, the Musgroves building in Murray Street, where on a hot night he would open the windows, which enabled listeners to hear the city trams pass by. There was not the proliferation of radio stations we have today, and it was common for David to receive music requests from listeners in other states, when the station propagation was enhanced by the atmospheric conditions at night. Often David was caught running two programs simultaneously, one for the regionals and another for 6IX in Perth, until the regionals could join the metropolitan program. His youngest son Peter recalls as a child changing records for his father in one studio, whist David was busy talking on-air in the other. At first, 6IX was half owned by WA Newspapers and half by the music store Musgroves, until the station became wholly owned by The West in 1963. 6IX then moved to Mounts Bay Road, until TVW bought the station in 1970, followed by a move out to Tuart Hill in 1971. By this time David was working in the traffic department, when the 6IX and TVW scheduling efforts were combined in the same section. David eventually joined the Supply Department with Ken Kemp, before retiring from the company in 1984. TVW Enterprises and 6IX changed hands in 1982, resulting in much upheaval as the culture changed with many long term TVW executives leaving shortly after. 6IX was sold in 1987 and everything changed, including the call sign to 6GL, being branded on-air as The Eagle 1080 AM, until sold again to regional operator Radio West, who re-instated the original 6IX call-sign. David was fortunate to broadcast during the golden age of radio, before television made its impact, for David to then conclude his radio career employed by Perth’s first television station. 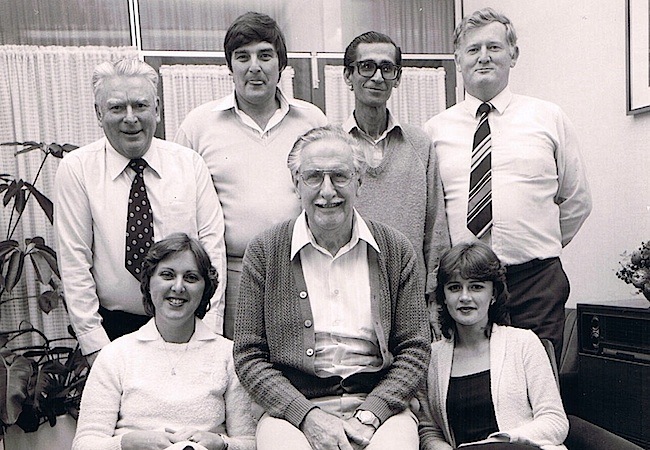 Many former colleagues were unanimous in saying that David was a gentleman, including Don Rock, Ken Kemp, Coralie Condon, Richard Ashton, Murray Jennings, Hilary Everard and Kerry Ryding. Sincere condolences to Peter and family on the loss of your father, grandfather and great grandfather. David’s wisdom and friendship will be greatly missed. Sam and Dominic Cuscuna and tenants of Maylands Park Shopping Centre. Dallimore (David ): Management and Staff at Mining and Hydraulic Supplies offer our sincere condolences to Peter and all the family on the sad loss of their father, grandfather and great grandfather. Fondest memories of David, a true friend and gentleman, who will be greatly missed. -Maude. People Who Care Inc were pleased to be able to help David with his gardening and transport to medical appointments. Everyone who had any dealings with David remember him with great fondness and affection. Our condolences to all his family and friends. Steve Johnston, Transport Coordinator, People Who Care Inc.
(David DeClifford ): David brought the civilized touch of the English gentleman to Australia. Father, Grandfather and Great Grandfather, we will all miss you Grampy. Mark, Julie, Erin and Nicholas Dallimore. Service Details Funeral service will be held at St Luke’S Anglican Church, Cnr Rowlands Street And George Street, Maylands, on Thursday, 20 October 2011 commencing at 10:00 am. I only heard today of the passing of David Dallimore and therefore too late to pay my respects at his funeral.I will always remember him as a thorough gentleman with a lay-back annoncing style that greatly influenced my radio career. When I joined 6IX way back in the 50’s as the first junior announcer ever to be employed by the station,David patiently guided me along all the right paths and helped me greatly to establish my style of presentation – ‘to be warm in your approach but convincing in a radio selling technique’. So to David’s family I want you to know just how much I thought of him, he will always be in my memory and when it’s my turn I will look forward to meeting him again.